Given my post history, you may have noticed that I’m a fan off the Fallout game series. Although my posts are basically all focused around Fallout 4 (at least so far) I have played some of the previous titles such as Fallout 2 and 3 earlier in my life. Needless to say, a post apocalyptic future captivates me whether it’s after a nuclear war or zombie infestation. So when a good friend of mine talked to me about a major inspiration for the Fallout series I knew I had to give it a try. Back in 1960, Walter M. Miller Jr. published a book called A Canticle for Leibowitz which today is considered a classic science fiction novel and ultimately led to much of the influence of the Fallout series. Miller was primarily a short story writer; in fact Canticle is the only completed and published novel he ever put out during his life time. 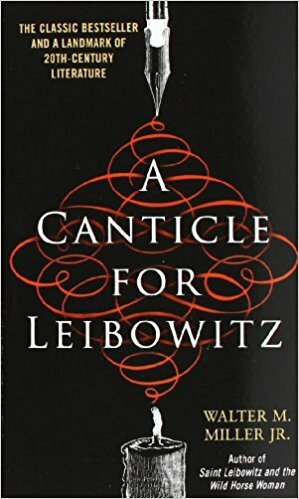 So it should be no surprise that A Canticle for Leibowitz is actually a collection of three novellas that he tied together in the same world but with each one set 600 years apart. Logically these three books do not follow one main character, but rather an order of monks known as the Albertian Order of Leibowitz who reside in an abbey located in a desert in the American southwest. The group was founded by Leibowitz himself shortly after the war and the order continued for centuries to preserve historic, scientific and religious (primarily Catholic) texts and artifacts so that the world may never forget them. The first book is called Fiat Homo and is set in the 26th century, 600 years after the nuclear war when Leobowitz lived. At this point, man is basically still in the Stone Age. It closely follows a young monk who goes into the desert where he ends up meeting an old wanderer. Shortly thereafter, he ends up stumbling into an underground passage where he finds a bomb shelter and relics that possibly belong to Leibowitz himself. Fiat Lux is the second book and it is set another 600 years later where civilization is now slowly but surely crawling its way back to where it once was. But at this point in time it is more in a social sense than rather a technological one. While there are nomadic tribes that wage war, other societies have also emerged such as peaceful states and cities. Political tensions also are beginning to run high though and the possibility of war is on the horizon. One fledgling civilization sends a secular scholar to visit the abbey to work with the monks and study their relics. During this time the monks, tending to their studies and experiments, make a miraculous discovery that ushers man into the next era. Lastly, the final book is called Fiat Voluntas Tua and it is again 600 years later in 38th century. Man has long recovered back to where it was before the war 1,800 years ago and is now leaps and bounds ahead. There are now colony planets outside Earth’s own solar system and space travel. The monks continue their preservation of relics, artifacts, and all knowledge in the same abbey. Unfortunately tensions between nations are still a common problem. This, coupled with the destructive technologies developed over time can now potentially set back man into the stone once again. It’s been a little while since I read this one so I hope my spoiler free summary above was half accurate and left enough open for someone reading this to be at least slightly intrigued. Travelling 1,800 years in one book gives the book a fresh feel in each section, from stone age to the renaissance to the future each feel like a new world being explored as you read on. Compared to my first book recommendation this is a much trickier read but not impossible, I found that given the themes it touches on its appropriate. Regarding those themes, Miller touches on some major ones focused around civilization and society. The pious monks strive to preserve both their religion and scientific relics which can seem contradictory but seem to bring noble merit to both the monks and the knowledge. With the revival of civilizations politics comes into play during the second book, this brings up the issue of the church vs. the state during the story. Morality is also brought into the picture during some gruesome events as well where again we see the church working hard to keep the high ground while understanding the logic behind some immoral actions. Lastly, and possibly the most important one, is the nature of man’s path which seems to come full circle over time. There are many others touched upon as well but these seem to be the major ones. I went into this book primarily expecting something feeling like a Fallout game. Perhaps a wanderer traveling the wasteland seeking something out. Perhaps a village struggling to survive the harsh land fill style terrain. Or maybe bandit tribes caught in constant war with each other. While I didn’t find the book matched my expectations I was rather impressed with its thought provoking pages nonetheless. I can definitely see how the Fallout universe was inspired, both from the first two’s desolate wasteland to the last books vision of a future that is well passed ours. If you’re a Fallout fan I highly recommend this one, and if you have any general interest in philosophy or retro futurism this is a great read too. This entry was posted in Recommendations and tagged A Canticle for Leibowitz, Book, Fallout, Video Games. Bookmark the permalink.